At the outset of this post, I’ll admit that I don’t have a particular devotion to this venerable saint and until recently I didn’t know much about her at all, save a passing reference to her as St. Benedict’s “twin” sister and the foundress of Western monasticism. That alone makes her worthy of great honor for the inspiration she serves to a great legacy of holy women who have chosen “the better part” which edifies the Church with a rich resource of prayer and spirituality. At the same time, on this occasion of her feast, I was moved to consider the challenge that her witness makes to us when considering the dilemma of fulfilling obligations or being present to others in need. In a passage from the Dialogues, attributed to Pope Gregory the Great, a story is recounted of one of the annual day-trip visits that Benedict made to Scholastica away from Monte Cassino. Seeing that the day was drawing to a close, Benedict entreated his sister permission to take his leave to return to his cell to abide by his vow of stability. 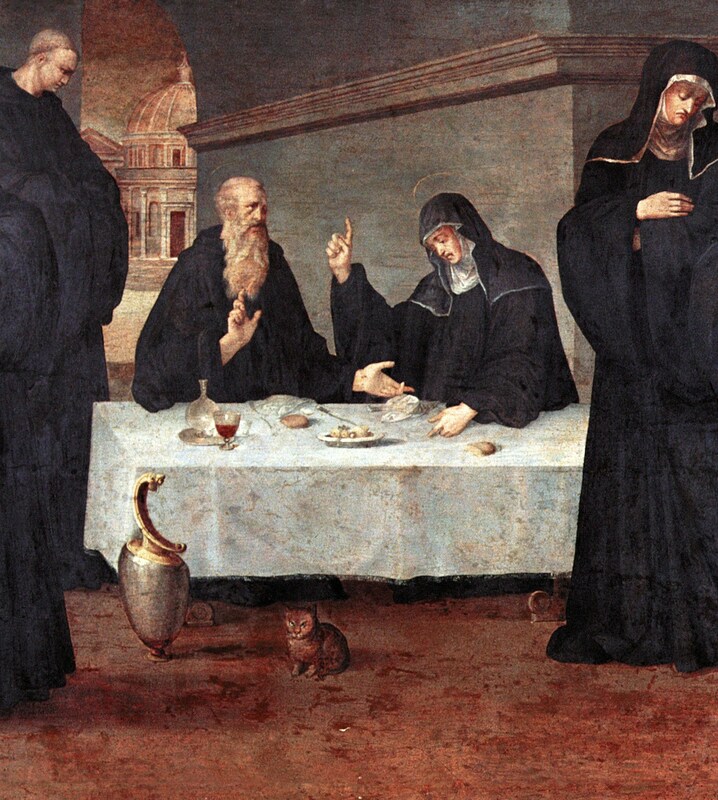 Scholastica, needing holy companionship and the consolation of time with her brother begged him to stay and prayed to God that her petition be granted. By means of a miraculous freak storm, Benedict remained with his sister, seemingly breaking his vows and becoming quite perturbed by this. Nevertheless they stayed awake together recounting the blessings received by God and each other. Three days later, Scholastica died, but Benedict received a sign confirming the rectitude of staying with his sister despite his vow. Indeed, looking at the passage from Luke, if we place any one particular relationship above our relationship to God, our love inevitably becomes disordered. We hold too tightly onto contingencies that cannot sustain us or try to sustain others in a way unworthy of the human dignity they possess as God’s image and likeness. Only by putting God first in our lives can we reflect God’s great love for each other in the many relationships which we cherish and with which God has graced us. Yet, the passage from Mark serves to check the potential myopic vision of carrying out the first commandment of the First and Second Testament. Jesus is clear he comes not to abolish the law, but fulfill it. In “dedicating” oneself to God and God’s vocation to us we can make another, potentially more grievous error of failing to recognize and serve God in others. When we esteem and integrate the insight of the Benedictine charism (ora et labora) and the Jesuit charism that grew out of that tradition, we become sensitized to the needs of those around us: our families, the poor in our communities, the lonely, and all marginalized. We recognize the great invitation and opportunity to love God in and through those persons, honoring the divine image in them. This spirituality grounds so much of the social teaching of the Catholic Church,—the preferential option for the poor, solidarity, participation in the common good—and it realizes the complementary vision we find in the symbolic relationship of Benedict and Scholastica. We must attend to both the direct contemplation of God above all while realizing through action that love of God in presence and service to those we meet in need of a “good word” each day.